When I was a kid, I remember so clearly my mom telling me that when I grew up my tastes would change and I would like lots of foods I didn’t like as a child. (A variety of vegetables were usually the main subject of these conversations.) I also remember thinking she was nuts – but as it turns out, she was right. Now that have become more skilled in the kitchen I sometimes wonder if at least part of the reason for my change in taste is simply a better method of preparation. For example, I will never forget the first time I ate asparagus. I was probably three or four years old and my nanny told me that she had a surprise for my lunch that I would really like. Then she fed me canned asparagus – one bite to be exact, and I didn’t touch the stuff again until I was a teenager. Turns out, I actually love asparagus, but it has to be prepared correctly. I think this is the same case with zucchini. I thought I hated it – alas, I think it is wonderful, and this recipe deserves all the credit. This has to be one of my most favorite veggie side dishes ever. It is incredibly simple and healthy, yet so flavorful. With little more than shallot, salt and pepper for seasoning, the zucchini is really able to shine in this dish. Not to mention, the recipe makes use of my new favorite technique – shredding the zucchini and squeezing out all the excess water, just like in the preparation of my beloved tzatziki sauce. It is just so fun! Because so much liquid is removed before cooking, what may look like a lot of zucchini initially is really just a normal amount. 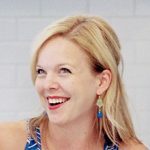 A side dish that is fun to make, healthy and positively delicious? I’d call that a keeper. Shred the zucchini with the shredding disk of a food processor or a large box grater. Toss the zucchini with the salt in a colander set over a medium bowl; let drain for 5-10 minutes. 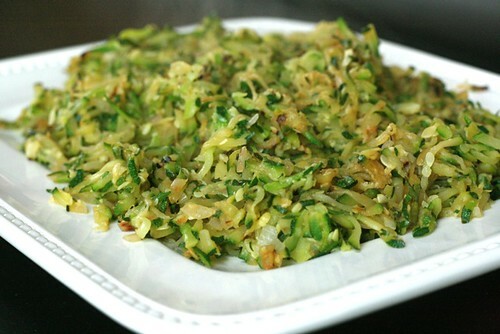 Wrap the shredded zucchini in a kitchen towel, in batches if necessary, and wring out the excess moisture. Add the zucchini to a medium bowl and toss to break up any clumps. Add the minced shallots and 2 teaspoons of the olive oil and toss to thoroughly combine. Heat the remaining 1 teaspoon of olive oil in a 12-inch skillet over high heat. 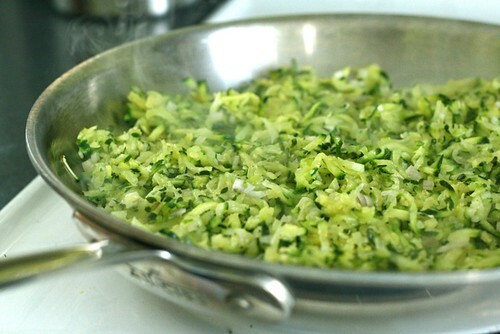 Add the zucchini mixture to the pan and distribute in an even layer. Cook without stirring until the bottom layer browns, about 2 minutes. Stir well, breaking up the clumps, and cook once more until the “new” bottom layer browns, about 2 minutes more. Off the heat, stir in the lemon juice and season with salt and pepper to taste. Serve immediately.